Well I finished my first semester at UC Davis for Wine Making. I enjoyed the semester but I have to say it was very hard and rewarding. My final consisted of three times tests. One was about varietals, the second was label laws (Europe and USA), and the final one was and overall of the semester. The first test on varietals I had an A. The second test, label laws was the toughest. Before my final test I studied for three days. I really do not prefer timed tests. After each test I reviewed the answers I had wrong, I estimate over 50% of the wrong answers I knew the right answer. I either misread the question or felt rushed. I ended the semester with an 80% “B” for a final grade. I’m happy but wished I had done better. Now I have to retake Chemistry! After my final was done I needed to have a stress reliever. I decided to have a glass of port and decompress. The Port looked pale and had a nice ruby hue. There is something about ports! 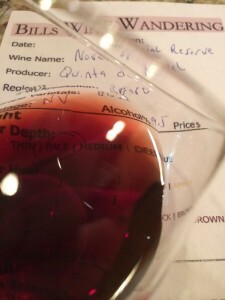 The Noval Special Reserve Port was very aromatic. It smelled middle-aged. I could smell caramel and sweet red fruit. The Port was slightly dry and medium-bodied. The acidity was very balanced. The tannins were week but I could feel slight astringency. It was very flavorful. Tasting the port it was soft and silky with a sweet mid palate finish. As I exhaled I could smell sweet red fruit. 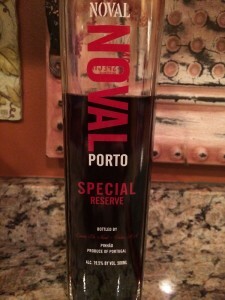 I rated the Noval Special Reserve Port three glasses.